With beach vacations being discussed, it has become officially time to kick some new year healthy eating up a notch (or three). This can be a challenge as one of my favorite ways to de-stress from the week is coming home on Friday nights, crack a bottle of vino, and have my way around the kitchen. Now on team healthy, my zucchini pizza has become a bit overworked. I needed a new fun, healthy dish that warrants my coveted Friday night meal. 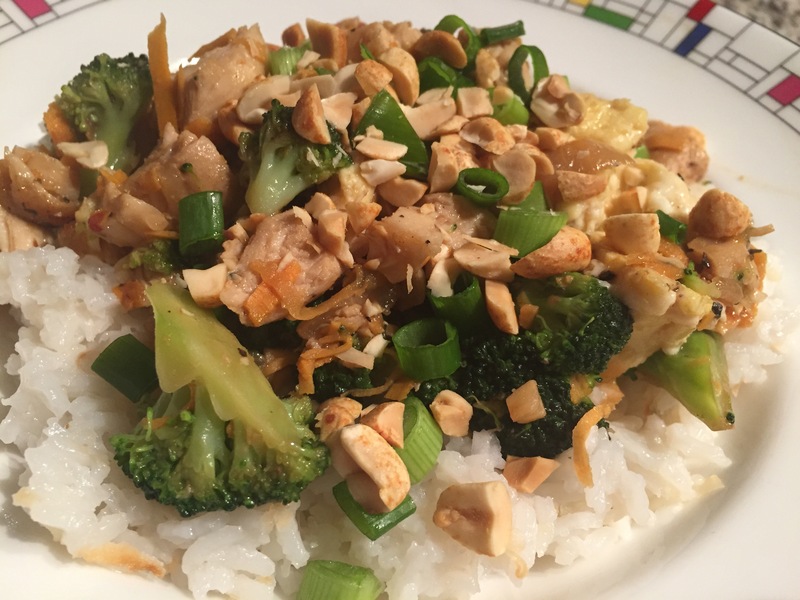 That’s how I found this amazeballs Thai peanut chicken stir fry. Disclaimer: this stir fry recipe called to be served over sweet potato “noodles.” Have you ever tried to spiralize a sweet potato? It’s hard AF. Don’t bother. You’ll see a few sweet potato shreds in my photos, but I ultimately ended up serving it over Chrissy Teigan’s sweet and salty jasmine rice – always worthy of Friday nights and overall, great life decision. Note: this doesn’t seem like a ton of sauce, but I assure you, it’s plenty unless you like it REALLY saucy, and who am I to blame you…it is almost valentine’s day. Heat the olive oil over medium-high heat in a cast-iron skillet. Add the chicken and sprinkle with salt and pepper. Cook chicken through, then remove and allow to cool. With the same skillet (do not clean), reduce heat to medium. Add onion and saute for about three minutes. Add garlic and saute for another three minutes. Add broccoli and any other veggies to the skillet. Salt and pepper veggies. Saute about 5 minutes. While this is happening, chop your cooled chicken into bite sized pieces. Add 1/4 cup of water to the skillet and saute another 3-5 minutes, until broccoli is the crunchiness that you’d like to eat it. Slowly add additional water if veggies begin to burn. In a small pan over medium-low heat, whisk 2 eggs and a tablespoon of water. Allow to cook, then break up with spatula. Return chicken to the pan with vegetables and mix everything together. Pour peanut sauce over everything and toss to coat. Add scrambled eggs to the mixture. Serve chicken over rice. 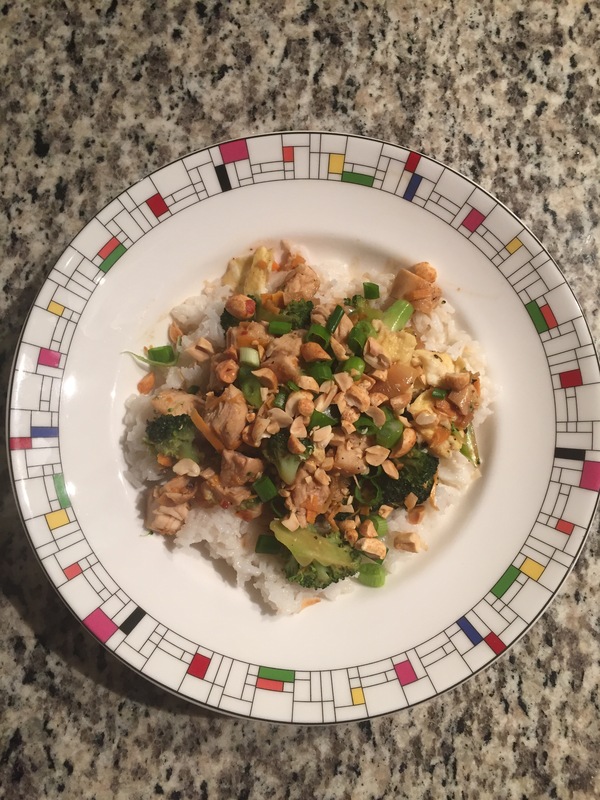 Top with peanuts and scallions. Don’t worry, ya’ll! The sweet and salty rice recipe is coming this weekend when I make it all again. This is THAT good!